Whether your company has moved to Google Apps for Work or you school has started using Google Apps for Education, here are ten tips and tricks to use Google Drive more effectively and improve productivity. 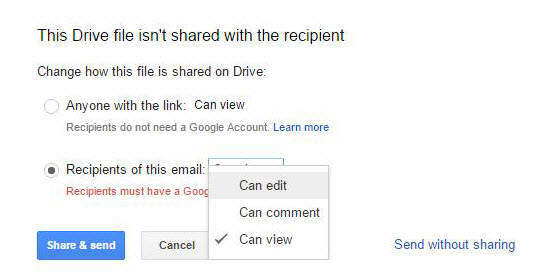 Oftentimes, new users to Google Drive assume that sharing Google Drive files are similar to attaching files to an email. Therefore, then users receive notification emails that files are shared, they assume that the incoming email’s hyperlinks are the only method of accessing the file. However, these shared files are still accessible from Google Drive. 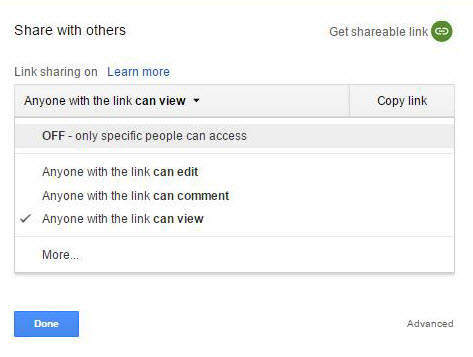 In Google Drive, there is a “Share with me” section in the sidebar. Shared files arrive in this location (in chronological order). While optional, these files can be organized in “My Drive” similar to organizing files in “My Documents” of a computer. Simply click on the file and then click the “Add to My Drive” button. A dialogue box will appear to select which folder to move the file to. 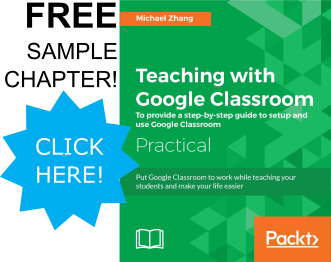 For more information, check out our tutorial about sharing files in Google Drive and sharing files to a large group of users. Files are often misplaced when stored in Google Drive. Because the “Upload file” is in the menu, many users do not consider where the file is currently being uploaded to. 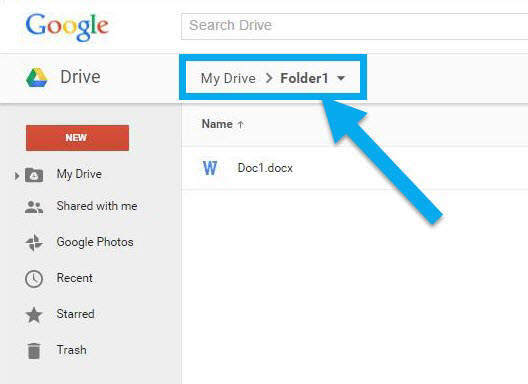 When files are uploaded, they are uploaded to the current folder location that is being displayed in Google Drive. Ensure that Google Drive is displaying the correct location for the file to be uploaded before it is uploaded. 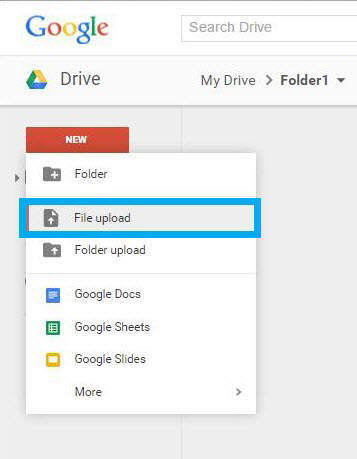 To learn more about uploading and downloading files to Google Drive, click here. 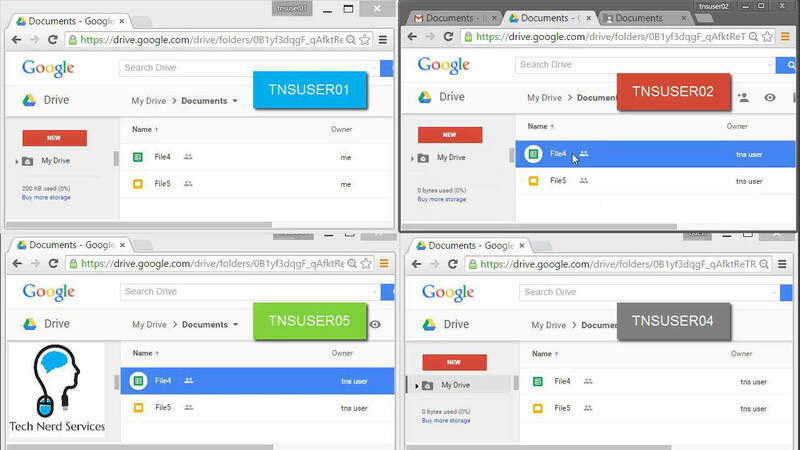 Many new users of Google Drive prefer to use Microsoft Office to edit documents instead of utilizing Google’s online Google Doc’s Suite to edit the file. Oftentimes, users will download a Google Doc to edit the file in Microsoft Word. 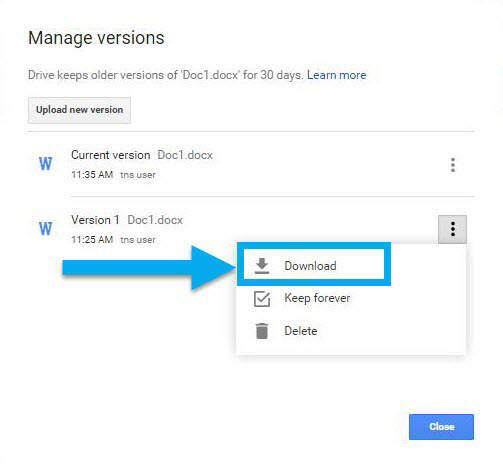 Once the file is edited, when the file is re-uploaded to Google Drive, they will appear as a new file that does not contain the same collaboration settings as the original files. When possible, if the document is a Google Doc, use the Google Doc editor to ensure all collaborators can see the changes. When uploading new versions of the same file, use the “Manage versions” option in the contextual menu. The dialogue box will have a button to upload a new version. Using this feature will preserve sharing settings of the document and still allow downloading of previous versions. 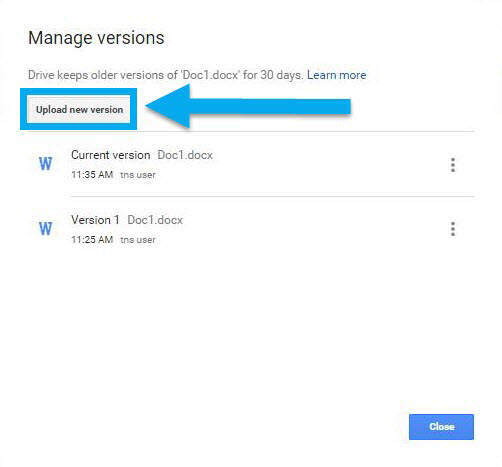 NOTE: Previous versions will be automatically deleted after 30 days unless the “Keep forever” option is selected within the “Manage Versions” menu. Learn more about managing and editing Microsoft Office files in Google Docs. 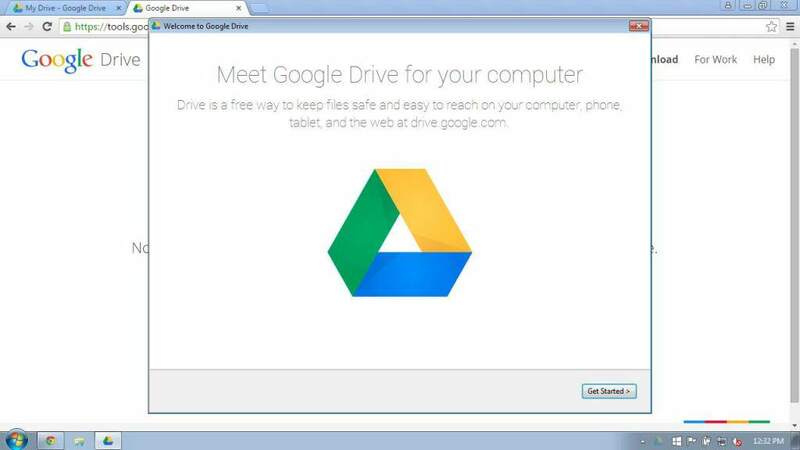 Also, you can install the Google Drive plugin for Microsoft Office. One easy method to grant editing permissions to several files is to share them in a folder with “Can edit” permissions. However, sharing folders in this manner also grants collaborators the ability to move and remove files from the folder. For example, if tnsuser01 shares a folder with “Can edit” permissions to three colleagues, another user, such as tnsuser02 can remove a file from that folder. The result will be that all other users will not be able to find the file in the folder. NOTE: tnsuser02 cannot delete the file because tnsuser01 is the owner. However, tnsuser1 will not be able to find the file in the shared folder. Therefore, the file will only be found when searching for the specific file. Another situation that can occur is if one of the users, such as tnsuser04 moves the file to “My Drive”. If tnsuser04 ignores the warning prompt stating that others will not have access to the file, a similar situation will occur. 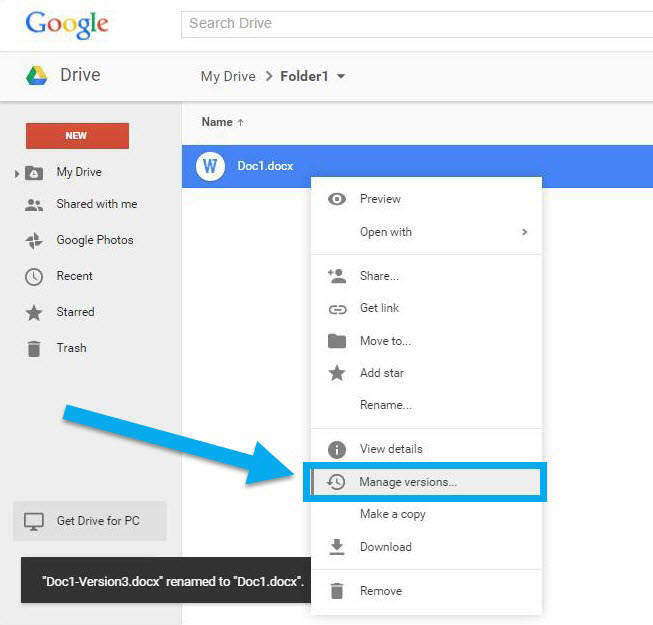 Therefore, avoid sharing a folder with “Can edit” privileges to a large group of users unless you are confident that they can navigate correctly in Google Drive. For more information about sharing folder, refer to How to Share Google Folders Correctly. 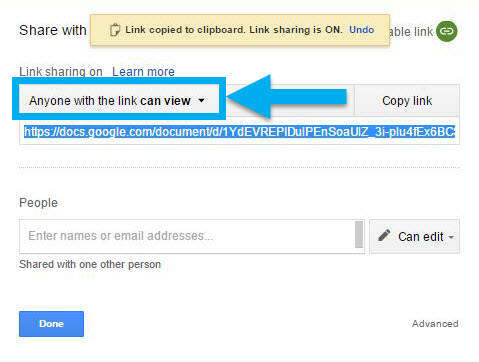 To simplify sharing files, Google Drive includes a “Get shareable link” option in the basic share settings. This feature is similar to other cloud storage solutions such as Dropbox or box.net that allows anonymous access to files through a hyperlink. Therefore, if this option is selected, any user who receives the link to the file can view the file. (This option is about as secure as sending a file as an attachment). At any time, the settings for this menu can be changed to allow commenting, editing or to disable the link entirely. NOTE: If you are using Google Apps for Work or Google Apps for Education, the default visibility of the file will be anyone within the company/school district will be able to view, not the public. Google Drive folders were previously called “Collections” because, similar to labels in Gmail, collections have more features in a folder. Despite the name change to folders, Google folders behave more like the labels found within Gmail. 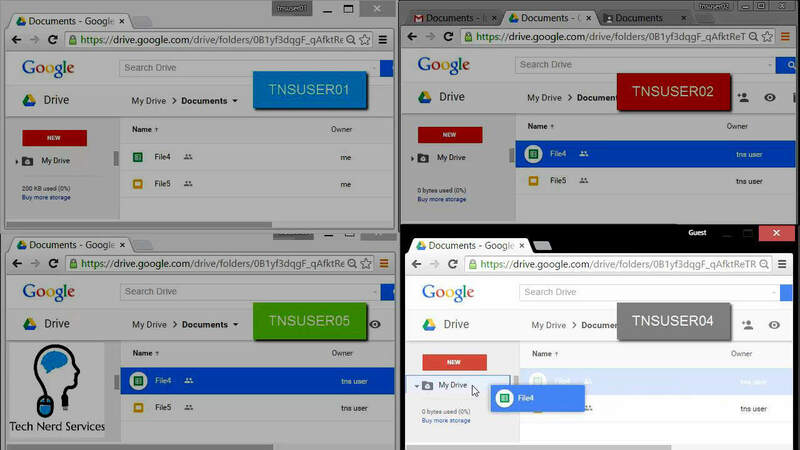 Files in Google Drive can exist is multiple folders locations at once. To add a file to a new folder without removing it from its current folder, simply hold the “Ctrl” key on the keyboard while dragging the file to a new location. A small plus sign will appear beside the cursor when the file is moving. When the “Ctrl” key is not pressed when a file is being moved, not plus sign is present. 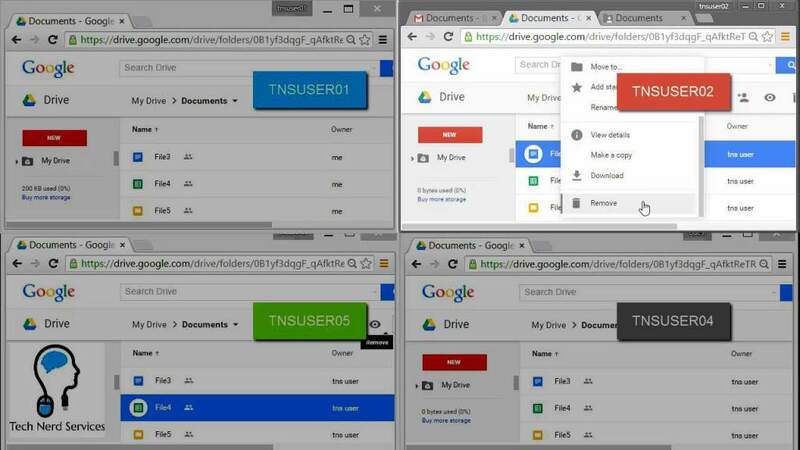 Using this feature reduces the need to create copies of files to place is multiple folder locations within Google Drive. 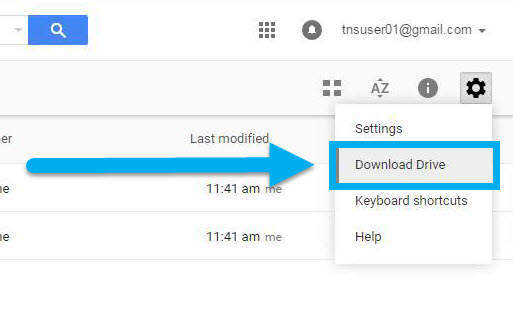 When composing emails, files stored in Google Drive can be included in a file by click on the Google Drive icon rather than the attach file icon in the email menu. The file can be found within the Google Drive dialogue box that appear. A new option will appear to grant the recipients with sharing permissions. 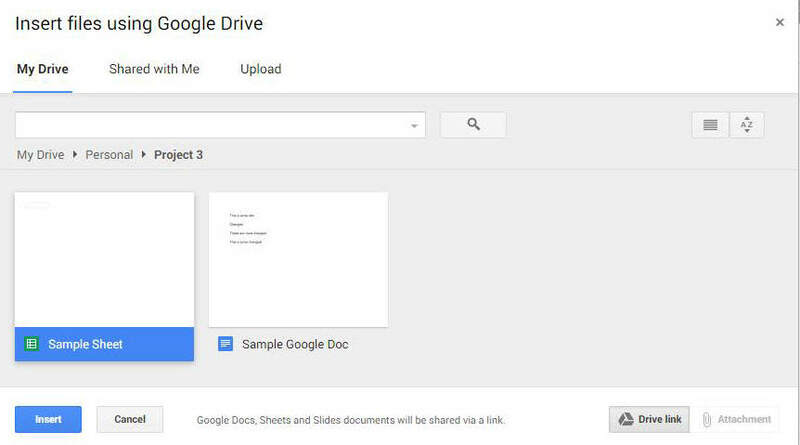 NOTE: If you are inserting a non-Google Doc file, there is an additional option to include the file as a traditional attachment rather than a Google Drive Link. When accessing the same folders constantly within Google Drive, a simple trick is to save the folder location as a bookmark. When the folder location is needed in the future, simply click the link in the bookmarks bar. Syncing files to a local computer simplifies document management as well as allows access to files without an internet connection. Like Dropbox, this program will create a folder in the User folders that will sync with Google Drive. In Google Drive, click on “Download Drive” in the settings menu. Select the desired operating system in the menu. Accept the terms of service and run the downloaded install file. 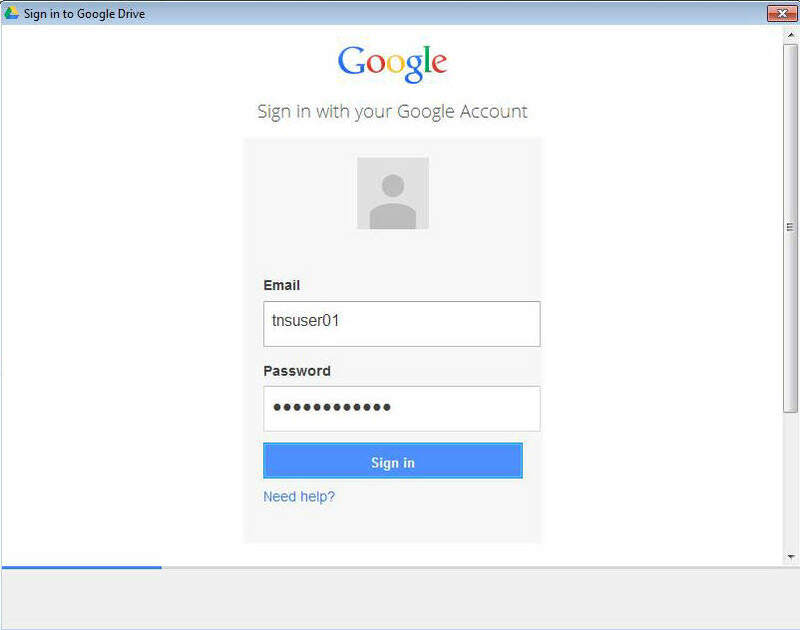 Once installation is complete, a window will open summarizing the features of the Google Drive program. In addition, it will prompt for the Google account information. 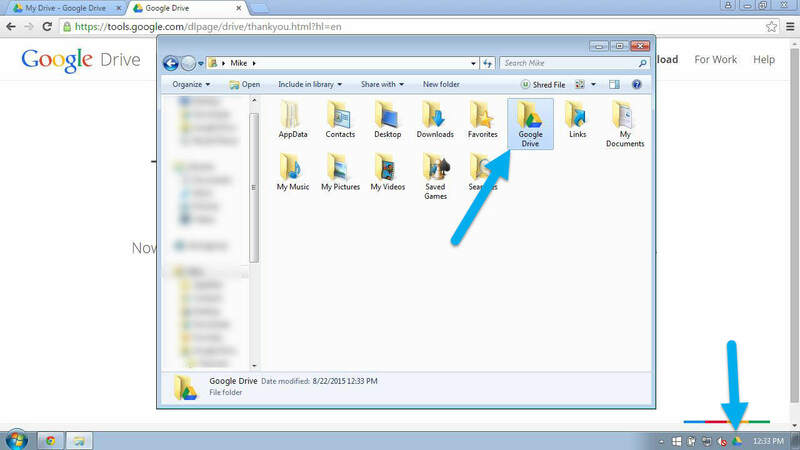 Once the Google Drive program is complete, a Google Drive folder will appear in the user’s folders. NOTE: Google Doc files will still open in a web browser and other files such as Microsoft Office files will open in their respective programs. 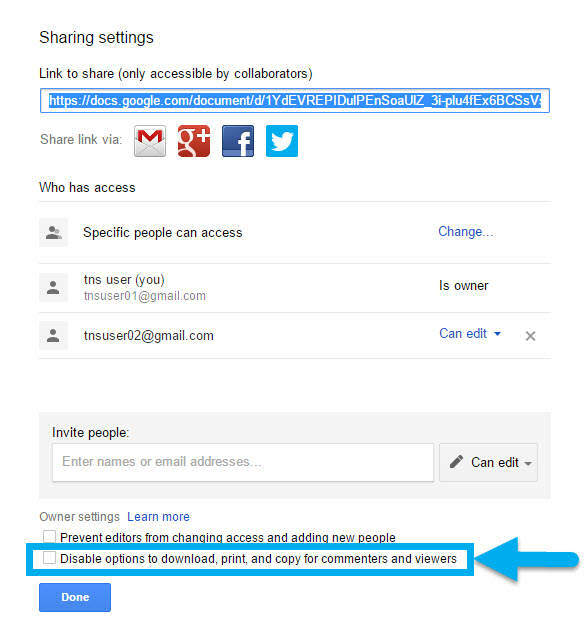 One new feature that Google Drive has added to it’s sharing settings is the ability to prevent collaborators from printing and downloading a document stored in Google Drive. To activate this setting, check the check-box found within the file’s advanced share settings. As mentioned in Ten Gmail features for Better Productivity, increasing productivity is not an overnight task. Instead, it is a gradual task that requires life-long learning. Try incorporating one a few tips at a time so that your business processes can adjust slowly. As will any skill, the more it is used, the easier its use becomes.